Delivery shall be deemed to have been made by You to WIC Valve five (5) after the date sent. By purchasing from Wisdom International Corporation (WIC Valve), you agree to these TERMS AND CONDITIONS. No other terms shall apply except as agreed in writing signed by us. We reserve the right to correct typographic errors and reject orders. Wisdom International Corporation (WIC Valve) warrants only this product is be free from defects in materials and workmanship at the time of manufacture. This limited warranty expires one year after delivery to the end-user. WIC Valve’s entire obligation to and the exclusive remedy of any party for breach of this limited warranty shall be limited to replacement of the defective product or refund of the original purchase price of this product, at WIC Valve’s option. Purchaser has thirty (30) days to return the goods after WIC Valve has agreed to accept the return. All freight charges on returned material shall be paid by the Purchaser. WIC Valve’s limited warranty shall not apply, however, to the product that have been subjected to misuse, alteration, accident or negligence during handling or storage. All implied warranties, which may arise by implication of law or application of course of dealing or usage of trade, including, but not limited to, implied warranties of merchantability or fitness for a particular purpose are expressly excluded. There are no warranties, which extend beyond the description of the faced hereof. The end user is solely responsible for the suitability and fitness of this product selected for a particular application. Failure or improper selection or improper use of the components and products described herein or related items can cause death, personal injury and/or property damage. 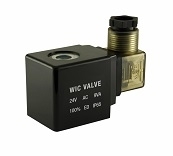 This document and other related information from WIC Valve provides products options for further investigation by users having the technical expertise. It is important that you analyze all aspects of your application and review the information concerning the component or product in the current catalog. Due to the variety of operation conditions and applications for these components or products, the user, through his own analysis and testing, is solely responsible for making the final selection, installation and maintenance of the components and products and assuring that all performance, safety and warning requirements of the application are met. All products set-ups and maintenance require the supervision of a qualified individual who is familiar with installation, inspection and testing through training or experience. The products described herein, including without limitation, product features, specifications, design, availability and pricing, are subject to change without notice. We continuously improve the products, and we reserve the right to change specifications without incurring any obligation to incorporate new factors in equipment previously sold. Copyright © 2012-2019 WIC Valve. All rights reserved. As a user, you are authorized only to view, copy, print, and distribute documents on this Web site so long as (1) the document is used for informational purposes only, and (2) any copy of the document (or portion thereof) includes the following copyright notice: Copyright © 2012-2019 WIC Valve. All rights reserved. This site may contain other proprietary notices and copyright information, the terms of which must be observed and followed. Information on this site may contain technical inaccuracies or typographical errors. Information, including product pricing and availability, may be changed or updated without notice. WIC Valve and its subsidiaries reserve the right to refuse service, terminate accounts, and/or cancel orders in its discretion, including, without limitation, if WIC Valve believes that customer conduct violates applicable law or is harmful to the interests of WIC Valve and its subsidiaries. We respect your privacy. Therefore WIC Valve never share or sell your personal information with any third parties. Any information collected through this site is intended to be used for this transaction only. Your personal information is secured via SSL (Secure Socket Layer) Technolog. At this time, WIC Valve ships merchandise to locations within the United States and U.S. territories, including Alaska, Hawaii, Puerto Rico, Guam, and the US Virgin Islands. Additionally, WIC Valve ships merchandise to Canada and Mexico, but not to other international locations. The risk of loss and title for all merchandise ordered on this Web site pass to you when the merchandise is delivered to the shipping carrier. Any shortages or mis-shipment must be reported within 15 days. Shipping laws are different in each country. It is your responsibility to check with your Customs office to verify whether the country to which you are shipping permits the shipment of your products. WIC Valve is not responsible for any direct, indirect, punitive, or consequential damages that arise from improper international shipping practices. No merchandise accepted for return 30 days after delivery date. No credit allowed on merchandise shipped as ordered and returned without obtaining an authorization number IN ADVANCE. A 20% restocking charge applies to all returns, and transportation charges must be fully prepaid. We will pay ground transportation charges on re-sent or returned merchandise due to WIC Valve's error.